Jacob Seagull PhD, Tommy Lee MD, Erica Sutton MD, Carlos Godinez MD, Gyusung Lee PhD, Adrian Park MD. Introduction: Minimally invasive surgery requires high-quality imaging to provide effective visual displays to surgeons. In many regards, a good surgical image impacts the conduct of a laparoscopic operation and ultimately patient safety. We understand little about what constitutes a good surgical image. While objective measures—such as pixels, resolution, display size, and contrast ratio—are often used to evaluate imaging systems, there are no validated tools for assessing the actual perceptual impact of the physical measures comprising imaging systems. 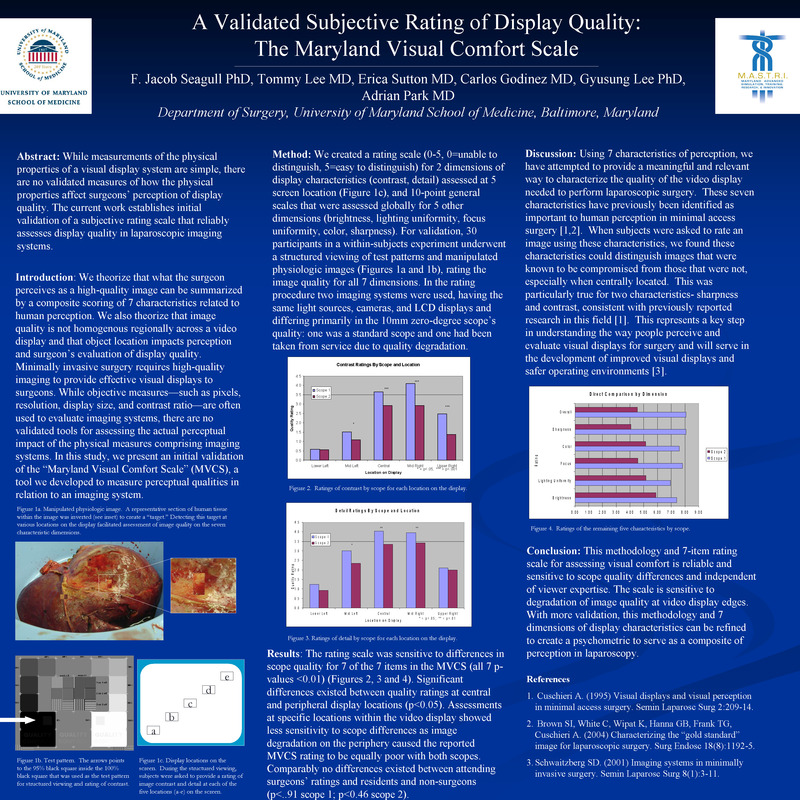 In this study, we present an initial validation of the “Maryland Visual Comfort Scale” (MVCS), a tool we developed to measure perceptual qualities in relation to an imaging system. We theorize that what the surgeon perceives as a high-quality image can be summarized by a composite scoring of seven characteristics related to human perception. We also theorize that image quality is not homogenous regionally across a video display and that object location impacts perception and surgeon’s evaluation of display quality. Method: We created a rating scale (0-5, 0 = unable to distinguish, 5 = easy to distinguish) for seven dimensions of display characteristics (contrast, detail, brightness, lighting uniformity, focus uniformity, color, sharpness). For validation, 30 participants in a within-subjects experiment underwent a structured viewing of test patterns and manipulated physiologic images, rating the image quality for all seven dimensions. Images were also rated for contrast and detail dimensions across five locations on the video display. In the rating procedure two imaging systems were used, having the same light sources, cameras, and LCD displays and differing primarily in the 10mm zero-degree scope’s quality: one was a standard scope and one had been taken from service due to quality degradation.